Within seconds of arriving in Key West the warm air fills the senses, within minutes, the bright sun warms our skin and within the first hour, it becomes clear that Key West is very different. Chickens appear out of nowhere and strut as if they own the place. According to the bartender at Sloppy Joe’s they do own the place. Harass a dog, nothing happens, harass a human nothing happens, harass a chicken and get a $500 fine. So now you have the answer, the chicken crossed the road to get to Key West. Chickens are sacred in Key West and they know it. 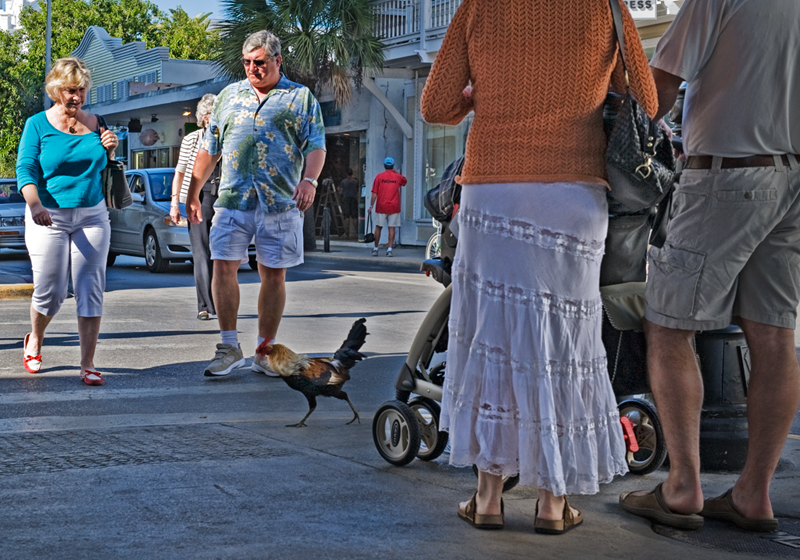 Chickens in Key West are smart, they look both ways and scamper through hurtling traffic with an uncanny ability to get to the other side with all their feathers. They look down their beaks at passing pedestrians and they actually make you wait for them. Just to reassure myself that humans were still in control I had a chicken sandwich for lunch and I enjoyed every minute of it.